Esportal is an online gaming platform where people can team up and play Counter-Strike: Global Offensive together. The platform has been built from scratch by our designers and engineers, using modern web technology. Esportal is a complex website that needed long term design work as the team behind Esportal evolved their concept. The design brief for Esportal was to find clear ways to display a lot of information without it feeling cluttered. We also had to create an intuitive user experience, to make the website easy to use despite its powerful functionality. It was important to find a design language for Esportal, as the website is continuing to add new features, therefore the website is designed to be modular. Esportal had faced challenges launching their platform for Dota 2. After making the tough decision to focus on Counter-Strike: Global Offensive instead, they contacted us for our help with the development of the platform. We wrote a requirements specification for the platform, and once approved, it only took us two months to go from the specification to an early beta that fulfilled the requirements. 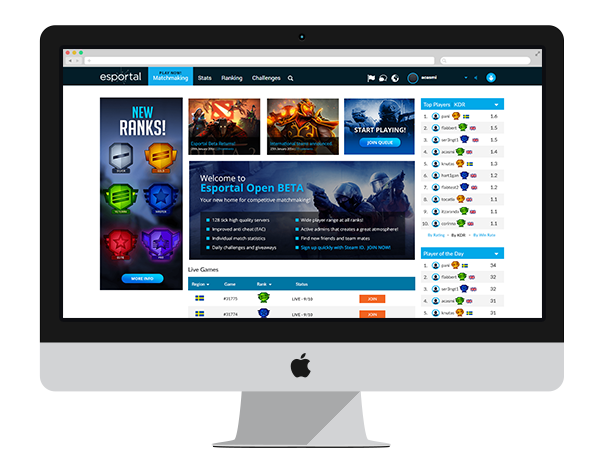 Since then, we’ve been working closely with Esportal to develop their platform further. Esportal uses a matchmaking system to match players into balanced matches. We’ve developed a matchmaking algorithm that generates match-ups based on Elo skill rating differences. Esportal has a social layer which utilizes real-time technology to synchronize chat messages, friend requests, online status updates, notifications, matchmaking invites, etc. In a network model where the servers trust the client (e.g. Counter-Strike), cheating will always be possible. We’re working on custom solutions to combat cheaters on Esportal. 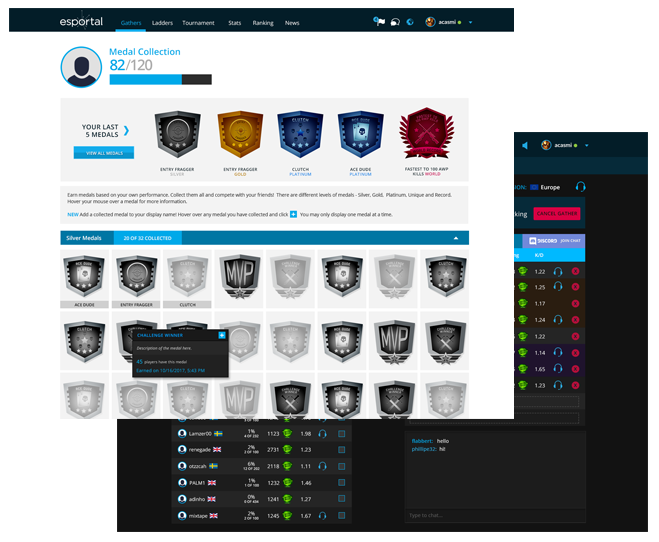 Esportal is a community website, that gives awards to it’s members in the form of medals and ranks. Users also increase in level from 1 to 10. We designed over 40 unique medals, in silver, gold and platinum colours. It was important that each medal be recognizable. 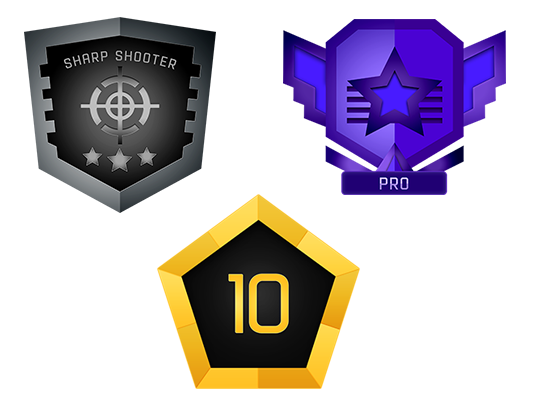 Esportal also requested 6 different rank images each in a different color and shape. Our concept for all the graphics on Esportal was modern and bold. Let us deal with the technical challenges while you focus on your core business. Get in touch!